We often spending hundreds of dollars on headphones, just to wind up losing them, forgetting them somewhere or breaking them while we’re attempting to be active. Can we also talk about how annoying it is when we realize we left our favorite pair at work and won’t have for our commutes home or for the gym that evening? Lucky for Us, there is a pair of earbuds on Amazon right now that promises excellent sound quality, added mobility and the power to drone out co-workers all for less than $15! But how do we know they compare to all the overpriced ones we always feel tempted to splurge on? They have over 56,000 positive reviews. 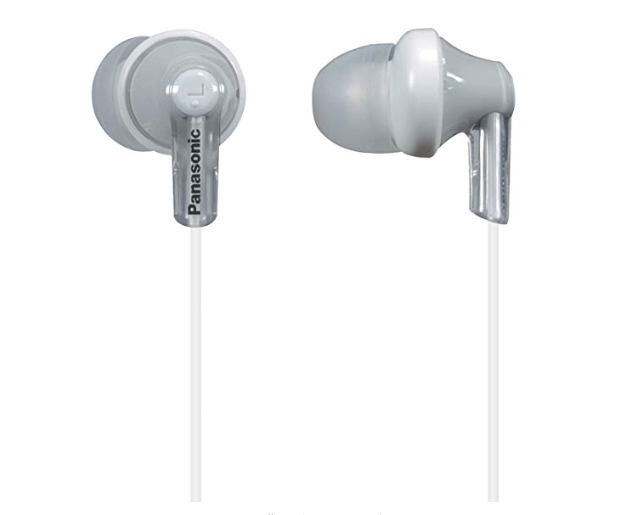 See It: Grab the Panasonic ErgoFit In-Ear Earbud Headphones for as low as $9 from Amazon.com now! Not a fan? Check out the thousands of additional earbuds that Amazon offers. Please note, prices are accurate at the date of publication, January 12, 2019, but are subject to change. The Panasonic ErgoFit In-Ear Earbud Headphones have quickly become a fan favorite and we’re here to share why, but first thing’s first: If you didn’t notice, it may have something to do with the price tag! The earbuds are currently on sale at Amazon starting at $9 for options without a microphone and starting at $14 with a mic. Both are available in a wide variety of different colors, depending on which option you choose. The headphones without a mic can be purchased in black, matte black, blue, metallic blue, orange, pink, purple, metallic violet, green, red, metallic red, silver, a white and black combo, matte black and red, and rose gold. The earbuds with a microphone included have a much smaller color selection and are only available in black, blue, pink, purple, and white. Technology moves fast, so many may wonder why these headphones are even relevant if phones nowadays are being made without headphone jacks. Have a new Apple iPhone that no longer has a wire headphone outlet? No problem! Many smartphones, and other Apple products, now come with an adaptor in order to use wired headphones. Not willing to buy an adaptor? This inexpensive pair of headphones can still work! Despite ever-changing technology and the fact that Apple insists this is a wireless headphone world, we can still use these epic Panasonic earbuds! Most desktop computers in offices still have the ever-handy headphone outlet, so now we can drown out that co-worker who is too chatty for Monday mornings! 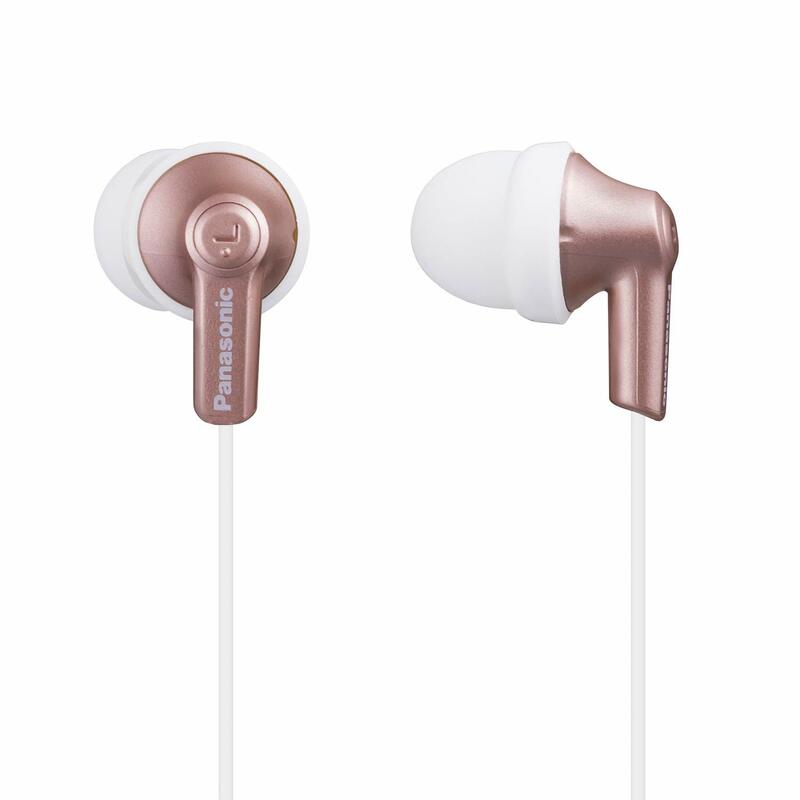 Speaking of sound quality, the Panasonic ErgoFit In-Ear Earbud Headphones, while basic and inexpensive, boast dynamic sound quality. These headphones have a wide frequency response range that delivers dynamic, crystal-clear sound while blocking ambient noise. Some of the best additional features include versatile styling with a comfortable fit. Each headphone pair comes with a set of earpads (small, medium, and large) that offers an ergonomic fit and won’t slip out while we’re working out, unlike some overpriced earbuds. With plenty of vivid colors to choose from, these would go perfectly with any one of our fun workout outfits. Of the 56,000 reviewers, the main message is that they are awesome, inexpensive and comfortable no-nonsense headphones. As for water resistance and combat-ability, they can definitely withstand our sweaty, intense workouts — Soulcycle included! Many customers explained that the ability to still work despite the sweaty factor was one of the reasons they enjoy the product so much, especially since marketed water-resistant headphones can often be very expensive. Many people mentioned the durability of these headphones, claiming that while they have had to replace their workout gear, sneakers, water bottles and such over the years, they still have the same exact pair of headphones. One person said that they go for long runs every day and have had the same pair for four years! Another shopper even uploaded a photo of a construction scene going on next to their office, claiming that despite the jackhammer drilling into the concrete, the only thing they could hear was their music. The noise canceling feature is apparently so good that one buyer explained these headphones can make us feel unaware of our immediate surroundings and expressed caution while wearing. Perhaps, we’ll stick with inside workouts when using these babies then!